Put on your armour and prepare your musket as you are about to enter the battle of Poltava. Pick a side and battle your way through the famous war between the Swedish and the Russians to win the battle of the online sloty game Poltava. 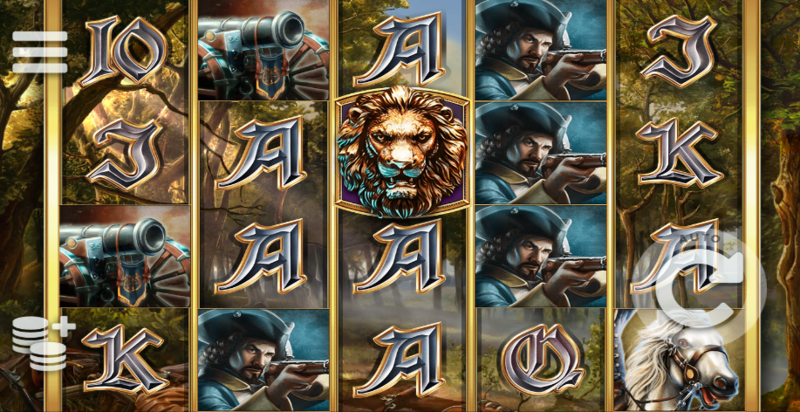 Spin the reels and match the symbols of soldiers and horses and bonus lion Wilds to unlock free spins in this picturesque online slot game. This astonishing game is designed by Elk Studios, the Swedish gaming development studio that is very well known for their philosophy of delivering high quality digital games to the online casino market, focusing more on quality rather than quantity. That’s how Scandinavians to the job! So why won’t you enjoy yourself with a spin on this amazing war/history-themed slots game from Elk Studios and see the amazing work they’ve done on this one. There are many Elk games available on Easy slot games. Passionate about history? 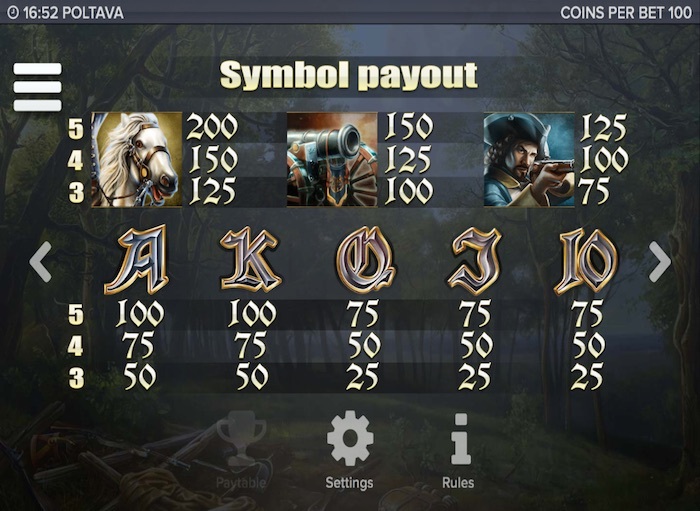 Then this one is for you, as the guys from Elk Studios have created an amazing title inspired by historical data by the name of Poltava, a revolutionary war-themed online slots game. An epic battle arises as the powers of the 18th century are about to clash in the northern Europe, with the great army of Tar Peter of Russia confronting the Swedish battalions in a war that remained in history by the name of Poltava. The Scandinavians lost the battle and the war as well as their peak was about to end. The flames of war are still mocking in this amazing slots game from Elk Studios, that is here to unleash your inner combat spirit and win amazing prizes. By means of design, this game is absolutely stunning, as all the graphics are detailed from macro to micro and all its elements are comprehensively assembled for you to experience the feeling of historical greatness. Inspired by their own origins, the lads at Elk Studios had the right place to inspire from, as their own country was part of this war that they now re-tell and use as inspiration for this fantastic game that they have developed. With a strategic play menu coming with a large palette of betting options and styles, this 5 reels, 40 paylines online slot games delivers a rich gameplay that is full of surprises and bonuses. Having common items such as classic cards from 10 to Ace that can bring you up to 100x times your stake, this game also comes with three more powerful symbols that can trigger the Marching Reels free spins feature if you land on at least 3 of them. These symbols are: the cavalry, the artillery and the infantry. The wild card on this one is represented by the Poltava game logo and it replaces every other symbol on the reels, facilitating you fantastic wins. This is not all as there is also the lion head symbol that acts as a sticky wild that will be there for more than one spin. Land on at least 3 lion heads and you will also trigger online slots with free spins feature of this game. 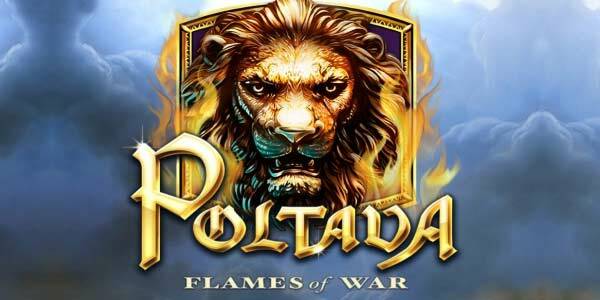 No wonder that Poltava slots game from Elk Studios is one of the most popular contemporary casino games after all that we have experienced playing this title, as it catches your attention from the loading screen and it carries you into a world of war and history where only the brave succeed. Take your chances and go on spinning and winning with this amazing online slots game from Elk Studios! Another mystical game for you to have a go at is our Jimi Hendrix Slots.